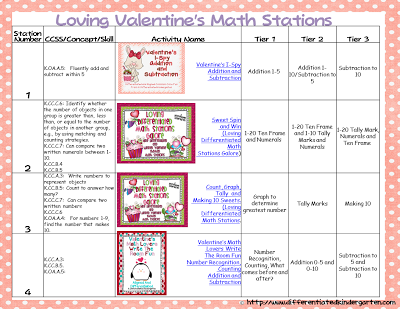 Three snow days in one week have left me ample time to get my math stations ready for February and the month of Valentine’s fun. So between building forts, doing laundry, picnics in the basement and all day board game tournaments, here are the activities and plan that I came up with for this months math stations. I had a couple extra left over that I’ll be using in my math learning center, so I’m feeling pretty confident . . . for now. Here are the plans. I decided to try something a little different this month. I am still using my same planning template but I noticed my bloggy pal DeeDee Wills (don’t you love her?) adds a picture of her item to her plans. As a visual learner, I love that. So I decided to try it on for size. I still have the CCSS alignment and how I tiered the activity for differentiation. I just added a little visual aide. Let me know if I should keep it or not. If you’d like a copy of these plans with the hyperlinks included, just click HERE. So when you look in my plan book. These are the plans for math stations you’ll be seeing. I tested them out on my sons during these past three Michigan snow days (I swear we’ll be going to school until July at this rate. ), and I’m thankful to have had them to keep them occupied. I got a thumbs up from all of them 5 years to 8 years old. If you want to learn more about the items please CLICK ON THE STATION TITLE or ON THE PICTURE CAPTION. I’m having some issues linking to my pictures for some reason. Station Number 1. 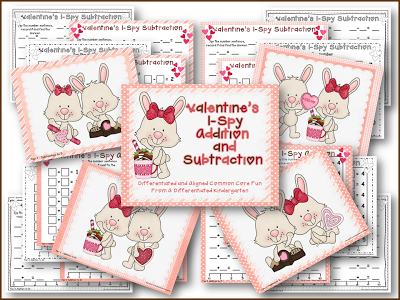 Valentine’s I-Spy Addition and Subtraction: A classroom favorite, this activity is differentiated so that you can have everyone working. 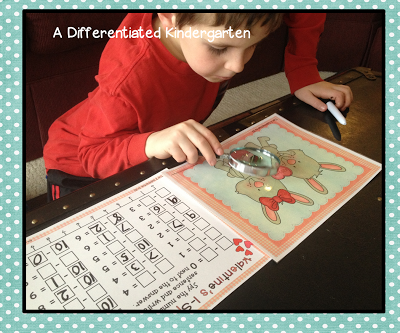 There are I-spy mats for addition to 5, addition to 10, subtraction to 5 and subtraction to 10. It includes a choice of two different types of recording sheets (with or without the answers) and a choice of colored or black and white sheets for your classroom. Click HERE to check it out. 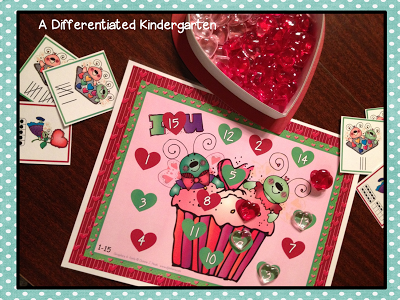 Station Number 2: Sweet Spin and Win (Part of Loving Differentiated Valentines Math Stations Galore). 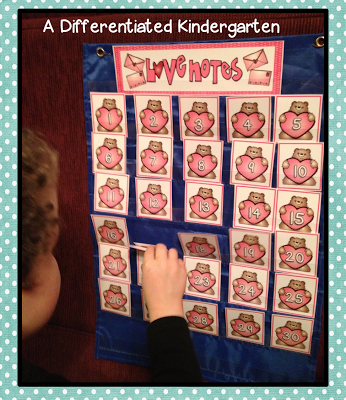 Number cards, ten frame and tally mark cards are available to help you differentiate this number comparison game. Spin to see who wins (the bigger or smaller number/odd or even number) and hope for a SWEET card which means you automatically win. You can find this item HERE. 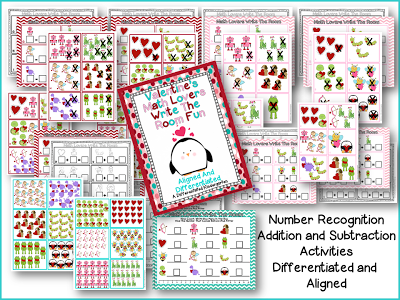 Two different counting mats are available for this activity and three different recording sheets. Once sheet has students finding out how many of an item they see and how many more they need to make ten (like the one below). Click HERE to see more about this set. And another recording sheet has them making tally marks. While a third recording sheet (not shown here) has them graphing the items to see which has the most and least. All recording sheets are available in black and white or color. 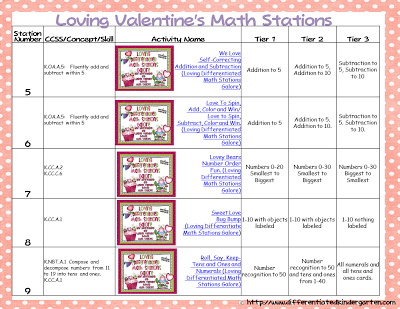 Station Number 4: Valentine’s Math Lovers Write the Room. There are three tiers to this activity. The blue tier are for your learners who still have not mastered counting and writing numbers 0-20. This blue tier features 12 squares with various numbers of objects 0-20. Students count the objects, write the number in the box on their recording sheet and then write the number that comes before and after. The next tier, the pink tier, is for students beginning to add (or subtract) to 5. 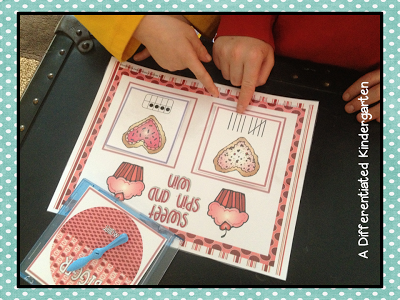 There are cards with pictures of two objects and corresponding recording sheet. Students search the room for these cards, record the number of each object and then add them together (or subtract), recording their answer. The red tier, for you most advanced students, can be used for your students who are ready for addition (and subtraction) to 10. 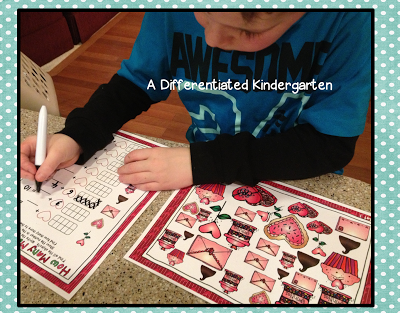 Each addition tier has 2 sets of cards and corresponding recording sheets to extend centers. These recording sheets are available in color or black and white. Find more about this activity HERE. 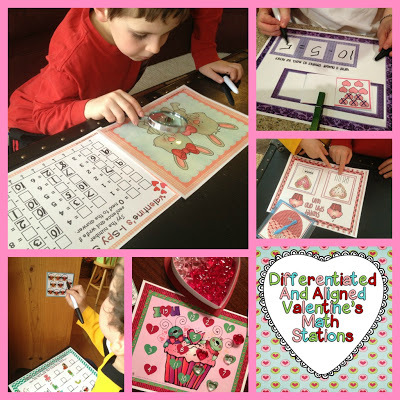 Stations 5: We Love Self-Correcting Addition and Subtraction (Part of Loving Differentiated Valentine’s Math Stations Galore) This self-correcting activity includes tow tiers for both addition to 5 and 10 and two tiers for subtraction to 5 and 10. It is independent and . . . my favorite part . . . self-correcting. They know instantly if they have done it right or not. Love that part. 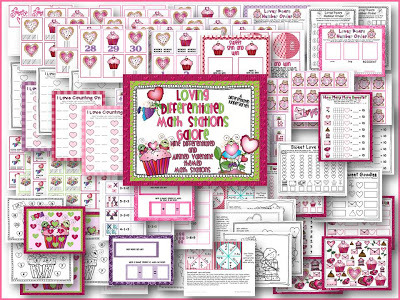 Station 6: Love to Spin, Add (or Subtract), Color and Win (Part of Loving Differentiated Valentine’s Math Stations Galore) This is an addition (or subtraction) activity with two tiers (0-5 or 0-10) for either. 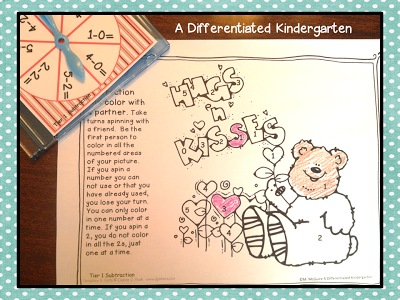 Each tier has 2 coloring sheets each for a total of 8 coloring sheets. Students spin, add (or subtract) and then get to color the number of their answer. First one to finish their picture-wins! 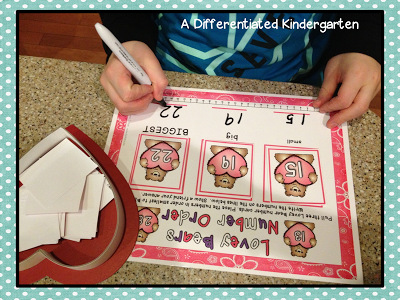 Station Number 8: Sweet Love Bug Bump (Part of Loving Differentiated Valentine’s Math Stations Galore.) There are three different tiered mats available for this traditional bump activity. 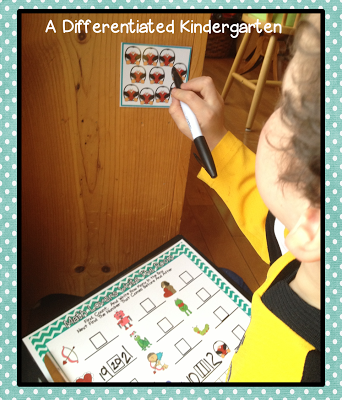 You can also differentiate by choosing to use wither tally marks or ten frame cards for this activity. For game markers, I use Dollar Tree plastic heart scatter pieces (love the Dollar Tree) for playing pieces and stick them in an old chocolate heart box. 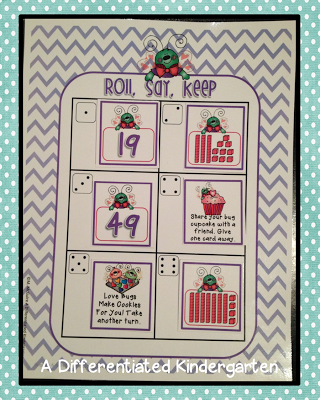 Station Number 9: Love Bug Roll, Say, Keep – Numbers and Tens and Ones (Part of Loving Differentiated Valentine’s Math Galore). 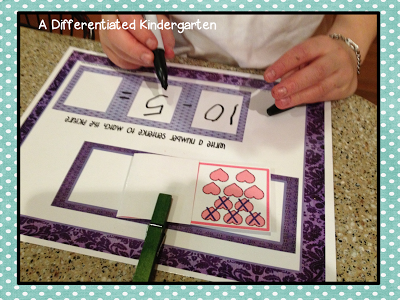 Use the tens and ones cards or number cards to differentiate this activity based on student readiness. There are also some ‘special fun cards’ to keep play interesting and unpredictable. See more about this item HERE. Those are the activities I’ll be using for math stations, but because I also use learning centers with my students. 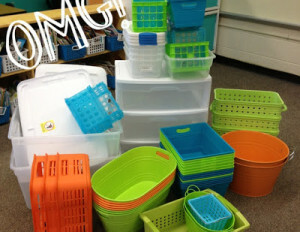 I have a couple of activities left over from my Math Stations Galore packet that I can use in my Math Centers as well. 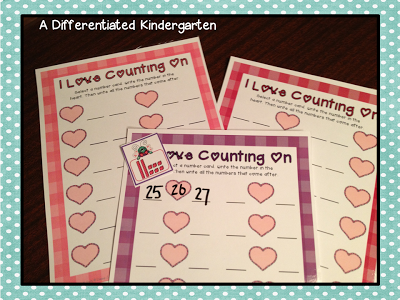 I Love Counting On- There are tens and ones cards you can use for this or number cards. Students draw a number and either write the number that comes before and after, before or after. 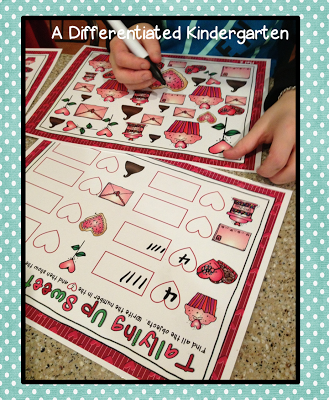 There are also black and white recording sheets for this activity if you prefer. And Love Notes- (Also part of Loving Differentiated Valentine’s Math Stations Galore). Students take turns hiding the love note behind a number while their friends guess where it is located. This is a great, well-loved number recognition activity. My students constantly ask for it. That’s math for February! Any questions? Leave me a note and I’m glad to help you out. For all you Word Work Lovers and ELA peeps, I’ll have my Word Work plans tomorrow or Friday for you to look over. Stay tuned. Remember, you can check out the products above by clicking on the station titles or on the captions below item previews below. Loving Differentiated Math Stations Galore 9 Differentiated and Aligned Math Stations. Getting Back Up To Speed . . and a big Giveaway! Wow, these look fabulous!  I can’t believe how close Valentine’s Day is. Thanks for posting your visual plans, they are so helpful (especially to a new teacher like me who is still trying to find the best way to plan)! I absolutely LOVE these and want to check them out! I love the visual on your plans too! Everytime I click on the picture it just enlarges it or allows me to pin it. I was hoping for a link so I can purchase it?